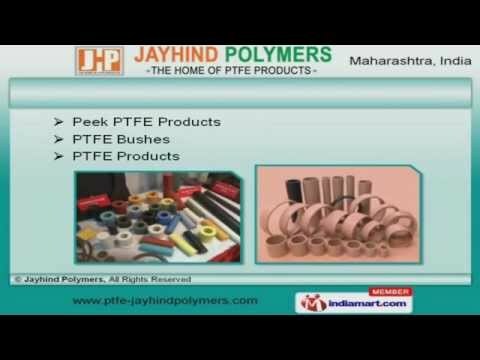 Welcome to Jayhind Polymers, Manufacturer and Trader of PTFE Products. The company was established in 1999 at Sangli. Our products are applicable in Chemical, Pharma, Food and other industries. Apex Polymers and Solitair Enterprises are some of our prestigious clients and we are backed by immense domain experience and transparent business deals. We present a unique range of Industrial, Glass Filled and Graphite PTFE Products. Our organization specializes in manufacturing qualitative range of Reinforced, MOS2 Filled and Modified PTFE Products. We are offering a top notch quality range of Peek PTFE Products and Bushes. Our PTFE Chemicals, Sheets and Rods are well known for their durability. We are highly instrumental in presenting a wide spectrum of PTFE Fiber Cloths, Seals and Packing. We are a leading firm engaged in offering PTFE Bellows, Gaskets and Rings that are highly efficient.